They allow for longer rounds, but I have seen nothing to suggest they are any faster in operation. Better penetration is more useful than high rate of fire. The difference in rate of fire is not that big anyway... we are not talking about a rifle where suppressive fire could be used. The practical rate of fire where a target is located, ammo type selected and loaded and then fire opened till the target is confirmed killed by the gunner while the commander looks for other threats and targets would be not comparable to max mechanical rate of fire. But most of the T-80s are replaced by nonupgraded T-72s, so they don't even have that going. T-80s were deployed to fairly important units... I rather doubt they will want such units equipped with old T-72s will old radios and no thermals... they will want to practise night fighting and net centric communications and use of battle management systems so they will need to be upgraded soon enough. Needless to say they are changing to T-72s because they can be upgraded when needed, unlike the T-80s which might need less of an upgrade but have a dead end development path. The Purpose of the B3 upgrade was that it was relatively cheap and simple yet provides the basics they need... ie night vision, new comms, net centricity, new gun for new ammo. If they were going to replace them with the T-90AM then I would agree with years, but if it does take years for this simple upgrade then someone has made a mistake. (with the replacement of ANOTHER 1000+ tanks by the T-72, not including the well over 1000-1500 T-72s already in service I don't think the prospects are exactly inspiring. Like I said.. B3 was chosen because it was the cheap and simple option to upgrade the fleet as rapidly as possible... do we assume that is no longer the case because the T-80s are going to be replaced permaturely? Perhaps it is because the other upgrades have gone so quickly they have decided they can rapidly upgrade more T-72s and remove the extra different vehicles from the vehicle pool earlier? Not replacing the engine makes it cheaper and quicker to implement the upgrade now. Later on a new engine can be introduced to replace the old models... new thermals, new comms, new gun, new ammo make rather more sense to me than a whole new engine and new drive train to take that extra power. 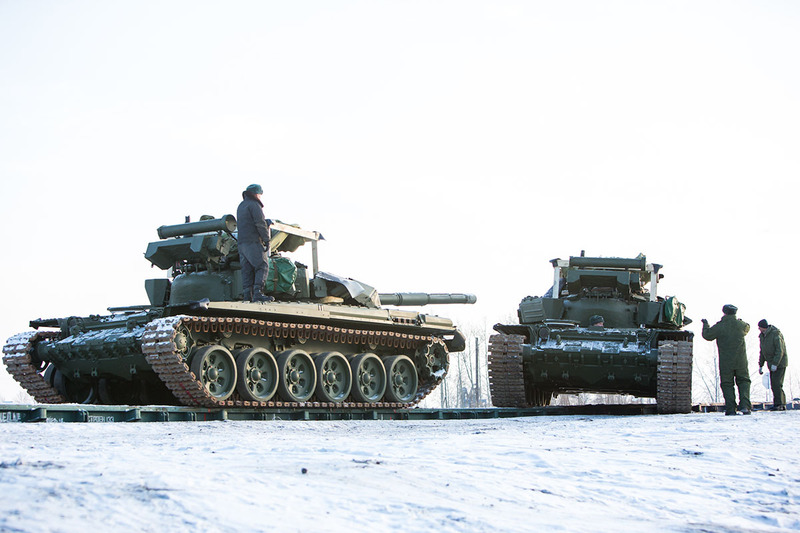 I like the T-80 too, but as you point out separate spares and support and training equipment is kept for a tank that might be superior to old model T-72s but not upgraded ones and are inferior to new model T-90s. They can't afford to keep every tank type in service just because it works. There are likely lots of upgrades for the T-80, but at the end of the day the T-90AM is the same size and superior performance. It is a bit like the Su-27 vs Mig-29, except with a Mig-29 that is in the same size and weight class as the Su-27. The Mig-29M is a capable design but not as good as the Su-35 will be... if the Mig-35 was the same size as the Su-35 then there would be no point... keep in mind that just like those planes each weapons platform has their own contractors and parts companies... the T-80 uses optics and engines and equipment from one group of companies (that will rely on this work), while the T-72/90 family have different companies supplying different engines and optics and systems. Dropping the T-80 means those companies need to be absorbed by the T-72/90 companies or they need to develop new products for different platforms that will be adopted. (Plus you know I am a fan of the Mig-29 family too). Does it fitted with the new 2A46M-5 gun? are there going to be more modernized T-72s back in service with russian army?? Yes, this year we are waiting for T-72B4...basically B3 but with panoramic sight. more like a hunter-killer B3 . would dramatically increase fighting efficiency- and since were living with the reality that he who sees first and shoots first most likely wins- increase killing proficiency too. Hell, this would make B3 better than M1A1. Can anyone tell.. which tank is this one.. ? of the active protection system Arena... anyone know? 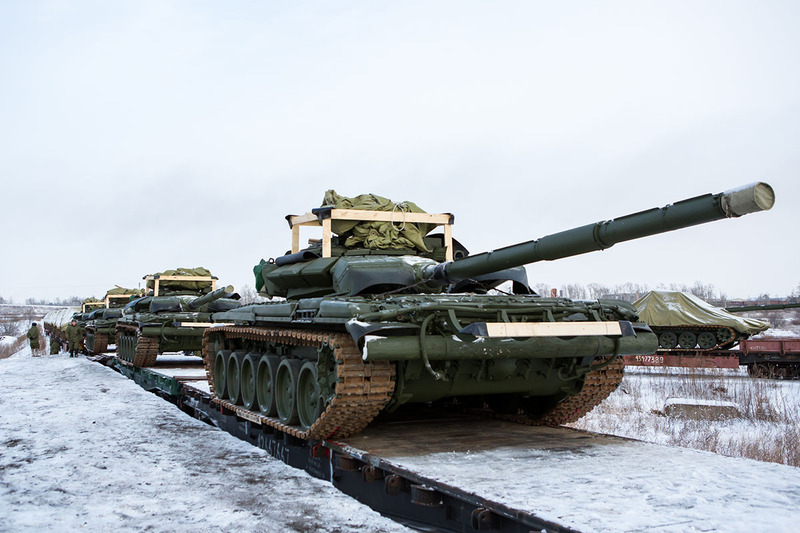 Russian T-72Bs arrive in Crimea, while T-64s are being sent back to Ukraine. The tanks look immaculate, I suspect these are some of the T-72s kapremont-ed and sent in replacement of retired T-80s. Would make sense given the wild numbers of supposedly modernized T-72B3s the media has been throwing around. You've got a time-stamp in that link there. What's "kapremont-ed"? Its disappointing they're sending basic Kontakt-ERA T-72Bs there - without even Kontakt-V. I would've thought T-72B3s would be a priority for Crimea, minimum. 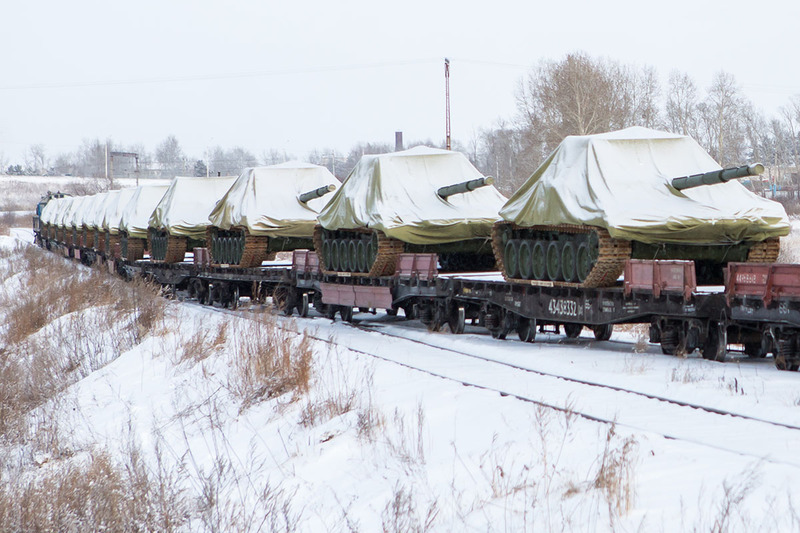 EDIT: wait - is Ukraine actually allowing Russia to train in tanks? Or are these going to be shipped across the Kerch strait? russkies dont make it a habit to flaunt their best toys- they want to keep it as a surprise to their most capable enemies. I would've thought T-72B3s would be a priority for Crimea, minimum. Such vehicles are only likely to face Ukrainian forces... what does the Ukraine have that would require a better tank? Kapitalnyi Remont- Capital Repairs- basically a major overhaul on a vehicle that has otherwise expired. By itself it might include no modernization or only small additions. T-72B3s with the thermal imaging sight and all the assorted fire control improvements would give them a decisive advantage over T-64BVs in both day and night. As it is, a hypothetical fight between a T-72B and a T-64BV is virtually a dead heat, performance wise. I'd bet on the training of the Russian tankists over those of Ukraine, but why leave an element to chance? It looks like from other videos I've seen on T-72B3s on trains that they're focused on the Ukrainian border proper. Let me put it this way... at the moment Ukraine has just been surprise-"taken advantage of from behind" if you know what I mean. If you start picking and choosing where your furniture is going they might get a little upset and do something really stupid. Equally things aren't 100% set in concrete... the Ukraine could go all Georgian on Russia, which means having upgraded T-72s to move into the Ukraine and deal with the idiots would be easier from Russian territory than from Crimean territory. Eventually a large unit of upgraded T-72s will be needed because it is the Black Sea Fleet basing area so any naval landing forces will need to be based there. They wont have Mistrals but they will have other units there, so together with army forces, navy forces, and air force units there will be a lot of new equipment and weapons moving there over the next few years. Ah good. Speaking of upgrades - is the T-72B3 created solely from T-72Bs equipped with Kontakts-5 ERA, or do they take any T-72B, and by the time they're done, its equipped with Kontakts-5? Kontakt-5 is expected to be bare minimum- its been out for two decades ffs. Kontakt isn't used since early 80s. Kontakt 5 is standard and Kaktus,Relikt are the new ERA's. Is there any news of new generation ERA for Armata platforms? Will Kurganets have ERA? Also whats the advantage of Relikt and Kaktus over Kontakt 5? I know Kontakt has a proven record; in a joint effort between Germany and America on a tank testing ground in West Germany, Kontakt has proven itself very effective at defeating NATO HEAT and APFSDS rounds of that generation, forcing NATO to redesign their rounds! Armata should use Relikt. IIRC Relikt has multiple layers of explosives and other material sandwiched together to form a large block. Kontakt 5 only has 3 layers, a steel plate on the back, the explosives, than a front steel plate. I believe "Kaktus" is the same thing as Relikt, but is just the name given to the layout of relikt when it's used as integral armor instead of add-on armor as we seen on Object 640. Relikt's been around for a while - ain't there anything newer in the works? And Kaktus I think operates on a different principle than Relikt, I may be wrong though. Seems like those 2 existed at least a decade before the armata platforms were even discussed. That doesn't actually answer my question though, sorry. To reiterate - does the T-72B3 upgrade derive solely from T-72B tanks already equipped with Kontakts-V, or do they also take T-72B tanks without Kontakts-V and equip them with it during the upgrade process? Because its clear the T-72B3 only has Kontakts-V, not Relikt.